After painting with candy and doing some candy math, we also had to try some candy science. 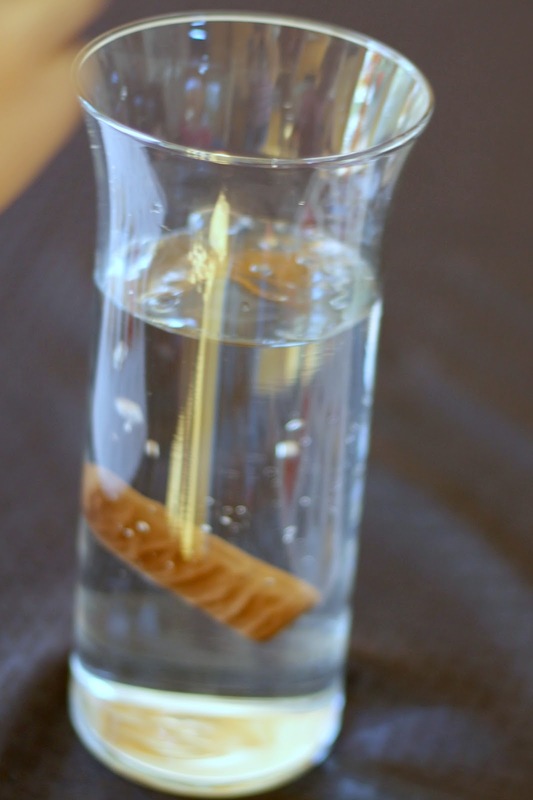 This is a simple sink or float experiment, but the kids loved it because of the candy. 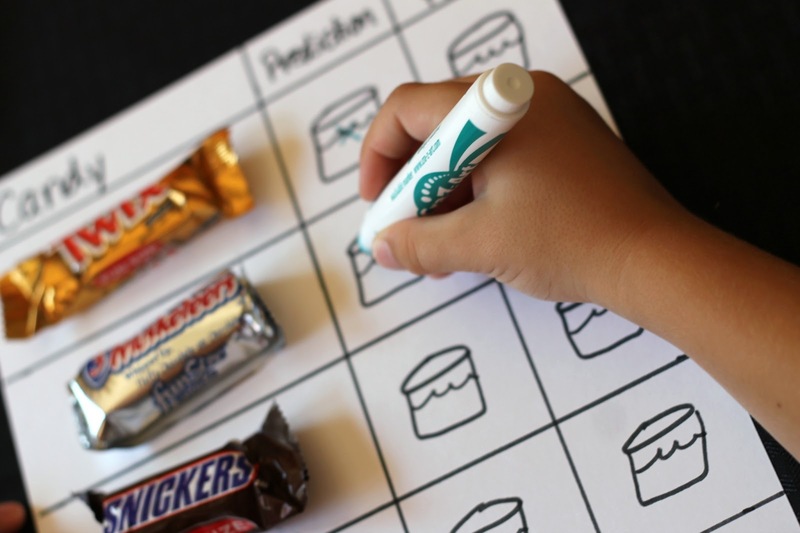 It's simple to put together and the only materials required are pen and paper, a selection of candy bars, and a bowl of water. 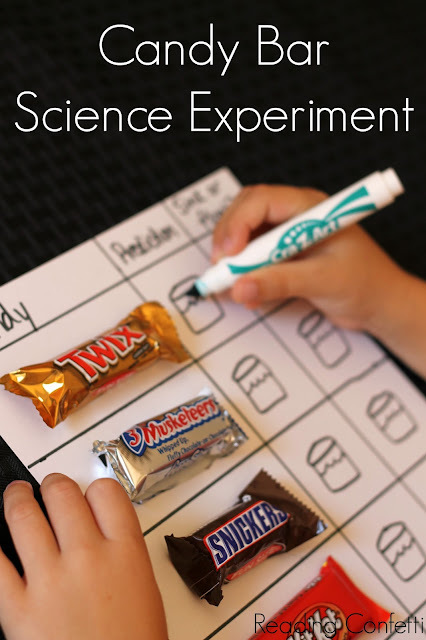 It's a great way to teach children about forming hypotheses and testing their ideas and also a nice way to use up all that Halloween loot. To begin, I made a very simple chart. 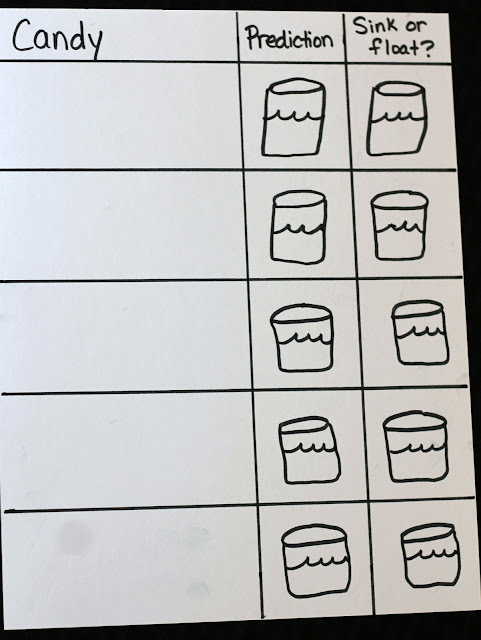 Since my kids aren't reading yet, I drew containers of water (you could totally tell that's what they were, right? Right??) in the predictions and results columns that they could mark. I put a different kind of fun size candy bar in each space in the first column. I didn't tape them down because I wanted the kids to be able to pick each up while they were making their predictions. 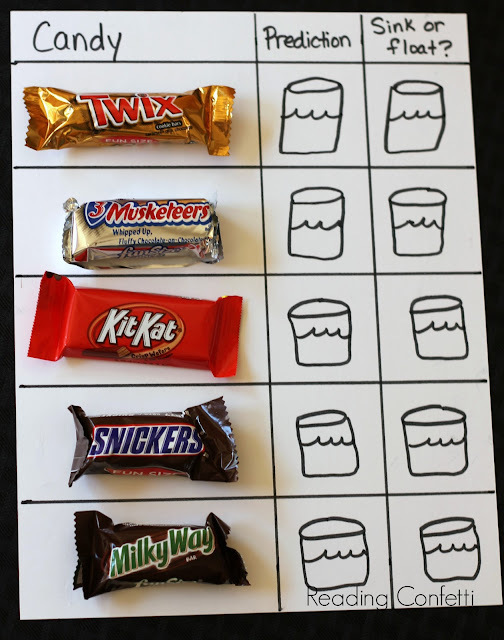 If the kids thought the candy bar was going to float, they marked the water at the top of the glass. If they thought the candy bar would sink, they marked the bottom of the glass. 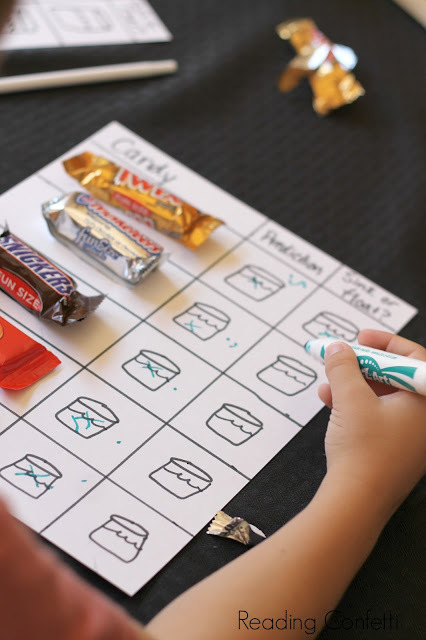 My five year old guessed that the bigger candy bars would sink and the smaller ones would float (makes sense to me). My three year old hedged her bets by coloring in the entire glass. She'd color the whole world pink if she could. 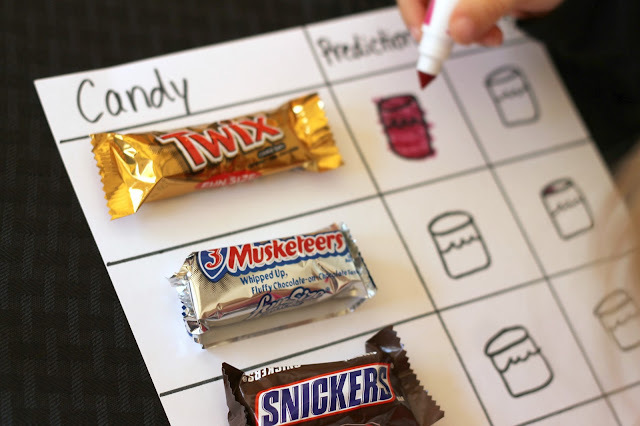 After they were done with their predictions, we dropped each candy bar into the water and recorded the results on the last column of the chart. Afterward, they did some of their own experiments by cutting the candy bars, putting them all in at the same time, stirring like crazy, and just generally making a mess. The Science: Anything more dense than water (like sugar) will sink, while things that are less dense than water will float. The Kit Kat and 3 Musketeers have a lot of air in them. Such a great idea to experiment with candy. I love that they explored (and made a mess) after the experiment. Love it! Looks like a great way to use up extra candy! Thanks for sharing at Mom's Library! I love that she colored in the whole thing! Great activity! Great idea! My kids love anything involving water and experiments. Awesome activity! We just did this today and my boys loved it! Thanks for sharing!!! Do you have to take the candy wrapper off??? Do you have a lab worksheet? Love the idea.... we are learning about density - what a fun approach!